These are two blocks of a quilt I am working on for my sister. I've decided to title this one "a walk in the woods". My sister is a very down-to-earth woman. She was a total grub as a kid; she was outside until her hands and lips were blue in winter and until her tan lines were baked into her skin in summer. When I think of her, I think of all the forts we built and games we played and the ear-to-ear grin she got when we get our hands dirty. She is now an incredible artist now and it is hard to believe she is grown up. The trees are self-explanatory; they are a gorgeous organic fabric from Cloud 9. The dragonfly fabric is Moda, as are the stained glass blocks in brown and turquoise. The dragonflies were the last fabric I chose. They really tied the quilt together. (Haha...just like the Dude's rug and his living room!) The orange made me think of the sun sinking through the trees and the way the light looks different in those late-summer forest fire hazes. I used white homespun as my base for the snowball block. My plan is to do a 10x10 quilt but it might get shortened to 8X10 (each block weighs in at 10" so it's quite large). I like a quilt that you can cover your head up with but still have toasty feet, but for my first large quilt it might be a tad ambitious. 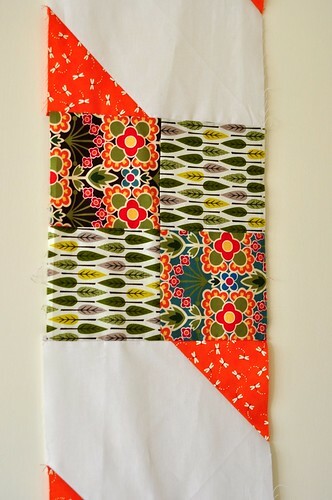 I haven't decided on hand-quilting yet but I'm leaning toward stitching leaves and tiny flowers. It is nice to be quilting again, and it is doubly nice that Mr Poppleton took care of the baby all weekend so I could use my rotary cutter and my sewing machine with relative ease! We'll see how the week will go: I would be very happy indeed to get the majority of this quilt top blocked by this time next Sunday! I have another sister's quilt to make...so I have to light a fire under my tail feathers. Time to get busy!